This is the google maps location of the area where the person (accused of being the attacker) lived after his release from prison. He died on February 15 by police bullets: link. 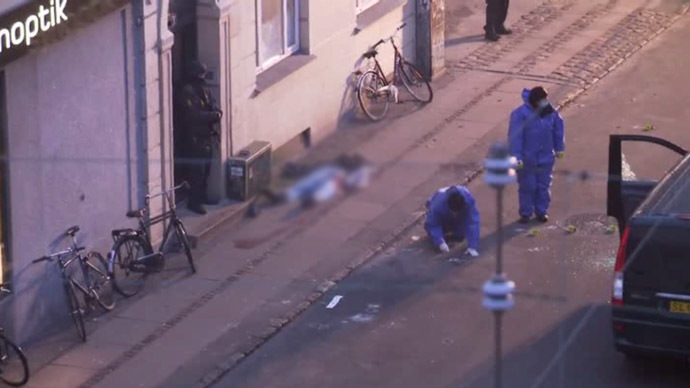 The media in the Netherlands said he was shot nearby the Norrebro station. What they didnot mention was, he was actually shot close to his home. This is the exact location where he was shot, just around the corner of Norrebro station (this is a link to google maps: link). Below the pictures. Somehow they left his body out there, while doing CSI work on the crime scene. He was 22 years old and born in Denmark. Appearantly, the police found ID papers in the stolen car the attacker left behind at the bus garage. Based on that, they put surveillance on his home address. When the police saw him, he started shooting at them (according to the police). They replied and killed him. Again I say: dead man don’t talk. The attacker just went home not expecting police. That sure sounds like a guy who just conducted two high-profile terror attacks. In the days after the shooting, people brought flowers to the place he was killed. This lead to discussion in the media. I am not surprised people mourn for a person who dies (no matter who he is, I am sure someone cared for him). It would have been nice to know with what objective they had left flowers at this location on Svanevej road in Norrobro district. Omar Abdel Hamid el-Hussein (22) was buried on 20 February 2015. While the regular Friday prayers were held in the mosque, a number of Muslims sat and prayed outside. According to the Islamic Society, twice as many people gathered in and around the mosque today than is usual for regular Friday prayers (400 people or so). After a short obituary for the deceased, his white coffin was carried out of the mosque and placed in a hearse. About 200 people were gathered around him on the cemetery. 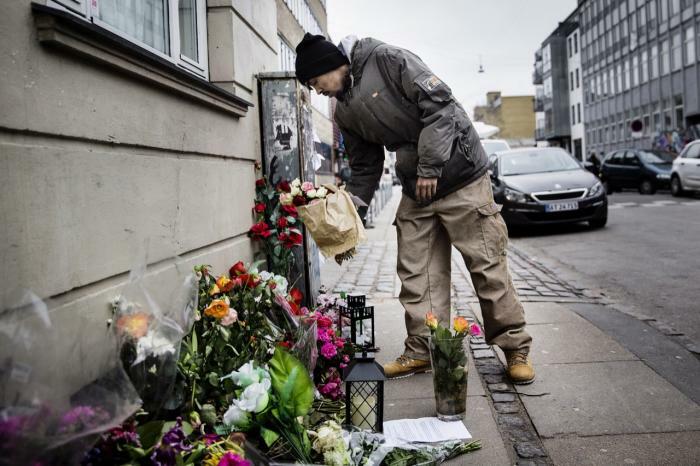 This entry was posted in Maatschappij and tagged guard, home, Lars Vilks, Norrebro, police, shooter, shooting, station, synagoge. Bookmark the permalink.